I received a Sam’s Club Membership and Gift Card for supplies as compensation for my time. The opinions expressed are my own. Surprisingly, I have never previously owned a warehouse store’s membership card but was thrilled to be able to work with Sam’s Club and benefit from the discount prices of buying in bulk! As my family is quickly growing shopping at a traditional grocery store has become very difficult for me and I find it much easier to buy in bulk and store foods in our chest freezer to not have to shop quite as often. I also love the wide open aisles and shopping carts that house two children up front that also make it so much simpler to get my necessary shopping done! The boys and I actually had a great time shopping at Sam’s Club as we picked up hot dogs for lunch and then they happily ate while I got busy shopping! It was time to pick up the ingredients for our next easy dinner recipes! 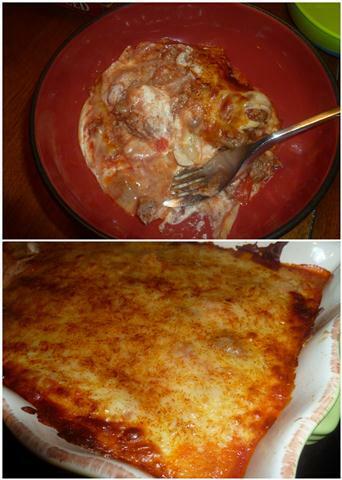 I decided for my second meal to make Lasagna! We have a really great recipe that lasts us a good 3 full meals or more often a meal plus lots of leftovers for us adults while the kids eat something else as they are so picky towards leftovers! Sam’s Club carried just about everything I needed, the only thing I didn’t find was Lasagna Noodles but I had several boxes at home and the recipe only needs half to 1/3 of a box of noodles anyways! Buying in bulk I could easily have made a double batch while I was already cooking and put aside the second dish in the freezer! 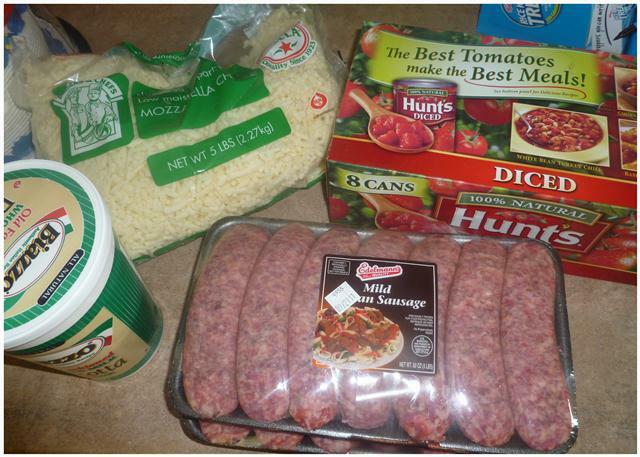 Here’s how we were able to incorporate Hunt’s Diced Tomatoes this time! Boil 9 Lasagna Noodles per package directions. Cut 1 lb of Italian Sausage out of the skin and cook on the stovetop similar to browning hamburger meat. Open a can of Hunt’s Diced Tomatoes (well-drained) and 2 small cans of Tomato Sauce, mix together with seasonings and sausage. Put a sparse amount of sauce on the bottom of your baking dish just enough to barely coat the bottom. Then, lay 3 noddles across the bottom of your dish. Next, add a layer of Ricotta Cheese onto the noodles. This works best if you stir up the ricotta so it has a smoother consistency. Then, add a layer of sauce/sausage mixture. Next, top that with Mozzarella Cheese. Then, simply repeat adding noodles, ricotta, sauce mixture and mozzarella until you have 3 full layers. Bake for 40 minutes at 350 degrees and enjoy! Boil 9 Lasagna Noodles per package directions. Cut 1 lb of Italian Sausage out of the skin and cook on the stovetop similar to browning hamburger meat. Open a can of Hunt's Diced Tomatoes (well-drained) and 2 small cans of Tomato Sauce, mix together with seasonings and sausage. Put a sparse amount of sauce on the bottom of your baking dish just enough to barely coat the bottom. Then, lay 3 noddles across the bottom of your dish. Next, add a layer of Ricotta Cheese onto the noodles. This works best if you stir up the ricotta so it has a smoother consistency. Then, add a layer of sauce/sausage mixture. Next, top that with Mozzarella Cheese. Then, simply repeat adding noodles, ricotta, sauce mixture and mozzarella until you have 3 full layers. Bake for 40 minutes at 350 degrees and enjoy! Want something really unique and different? My husband LOVES to make Stuffed Peppers filled with a rice mixture of Rice, Hunt’s Dice Tomatoes, Diced Peppers and Onions! 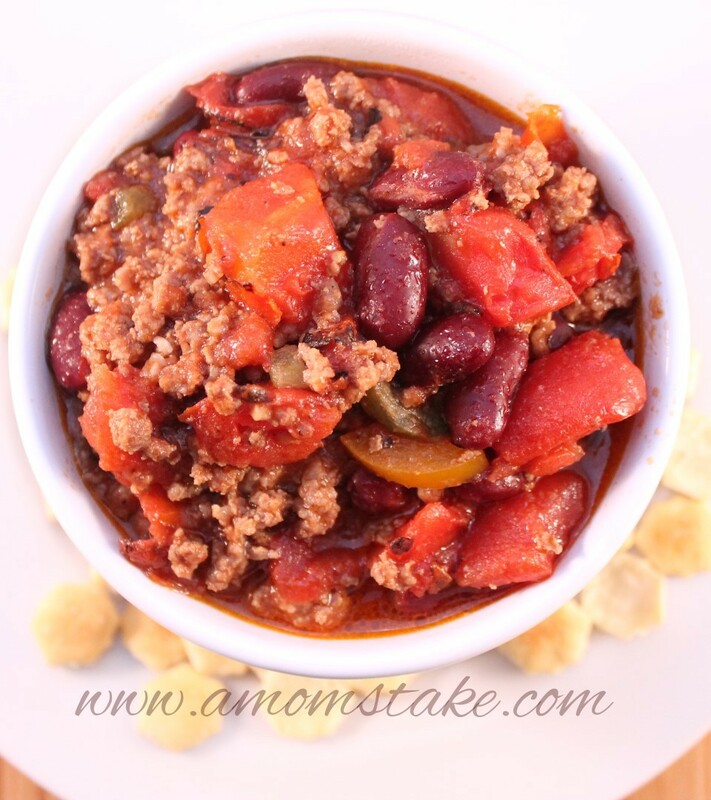 Try out our Extra Chunky Chili recipe, next! That Lasagna looks so very good. I will have to try this recipe. I also noticed that you mentioned stuffed peppers. my husband and I love them ( the kids, not so much). I love shopping at places like Sams Club. I use them to make cabbage rolls. I mix pork sausage, ground beef, cooked rice, diced tomatoes, onions, and salt, pepper, and garlic powder place the mixture in blanched cabbage leaves and roll. Then I cover the rolls with more diced tomotoes and their juice and bake for 2 hours on 350.